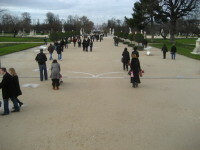 After checking out the Louvre, we walked through the Tuileries, down the wide main boulevard through the park, taking some time to look at all the statues and fountains. I can’t wait to go back during the spring and see it all in bloom. At the end of the garden, there is a ferris wheel, an obelisk (a real one from Egypt!) 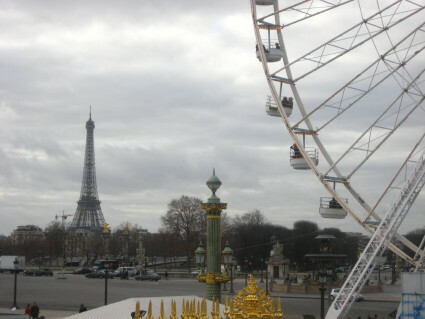 and a neat view of the Eiffel tower, which looked kind of gloomy the first day we saw it. There were also some neat fountains and a view of the Arc de Triomphe. Sunday, we went back and walked the other way down the Champs Elysees, and we stopped into a really interesting Toyota concept store/design gallery that had concept cars and other interesting design objects relating to technology and communications. 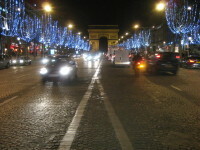 We also got to see the street at night. It was lined with trees with blue lights on them and they also had these long light tubes that light would fall down in that gave the impression of snow falling through the trees.